It’s that time of year again – the nights are drawing in and the festive season is drawing near. Mum and I have just finished baking our first vegan christmas cake, packed full of healthy dried fruit and spices. It’s been wrapped in baking parchment and foil and will be fed with brandy every week until it’s time to decorate, hopefully giving us a perfectly moist and delicious cake in time for Christmas! Mum and I have recently discovered the wonderful ingredient that is Aquafaba – which (believe it or not) is the liquid left over in a can of chickpeas! (or other beans). It can be used to make incredible vegan meringues, and works as a fantastic egg replacer (click here to read a recent Guardian article about all things aquafaba!). To ‘veganise’ our Christmas cake, Mum and I simply replaced the milk with non-dairy milk, the butter with vegan spread, and the eggs with 3TBS of Aquafaba per egg. In case you’re yet to bake yours, here is a recipe from Lise’s Mum (with veganising tips!) to give you some inspiration. We have everything you need to bake your perfect Christmas cake, so call in and stock up soon! Mix raisins, currants, almonds, mixed peel and glacé cherries in a big mixing bowl. Sprinkle 2 tbsp of flour over the bowl contents and mix it in. In another large mixing bowl, cream the butter (or spread) and the muscovado and then mix in the vanilla sugar and syrup. Mix the eggs (or aquafaba) one at a time into the mixture, adding the remaining flour (sieved) a little at a time, with cinnamon, nutmeg and the prepared fruits. Mix it well – the dough should be very heavy to stir now. Dissolve the bicarbonate of soda in the milk and pour into the bowl. Finally, add as much brandy or rum as needed to make the dough smooth and easy to stir. Grease a 24 cm round cake tin and line the bottom and sides with baking parchment. Turn the mixture into the prepared tin and smooth the surface. Cut one or two long strips of baking parchment, 1 1/2 to 2 times wider than the height of the cake tin. Tie them round the outside of the tin with cotton string. This is important to protect the cake from burning during the baking. Place the cake tin on a baking plate in the 140 degrees warm oven and bake the cake for 3 1/2 to 4 hours and then test with a skewer. If not ready, bake for a little longer until the skewer comes out clean. Remove from the oven and leave to cool in the tin overnight, then turn out on to a wire rack and remove the baking parchment. Make small holes in the top of the cake and pour over 50ml of the brandy/rum. Store the cake wrapped in baking parchment and then a layer of foil. Unwrap the cake and spoon over a few tablespoons of brandy every week until you are ready to ice and decorate (at least a month later). Roll out half the marzipan to fit the top of the cake (1/2 cm thick) and roll out the rest in strips to fit around the sides of the cake. This is easy to do on baking parchment and with cling film on top. Warm the apricot jam and water together, and brush the cake all over with it. Place the marzipan on top and around the cake before smoothing the edges together with a knife. You can now decide whether you simply wish to decorate the cake with sieved icing sugar and a marzipan rose, a small branch of mistletoe or Christmas ornaments before serving – or if you’d like to ice the cake (at least two days after the marzipan). To make the icing, lightly whisk the egg whites (or aquafaba), and then add the lemon juice and the icing sugar at intervals. Beat well until the icing reaches soft peaks. Spread icing all over the cake – either flat iced using a clean ruler or by forming soft peaks. To keep the cake moist, it’s a good idea to store it in a cake tin. 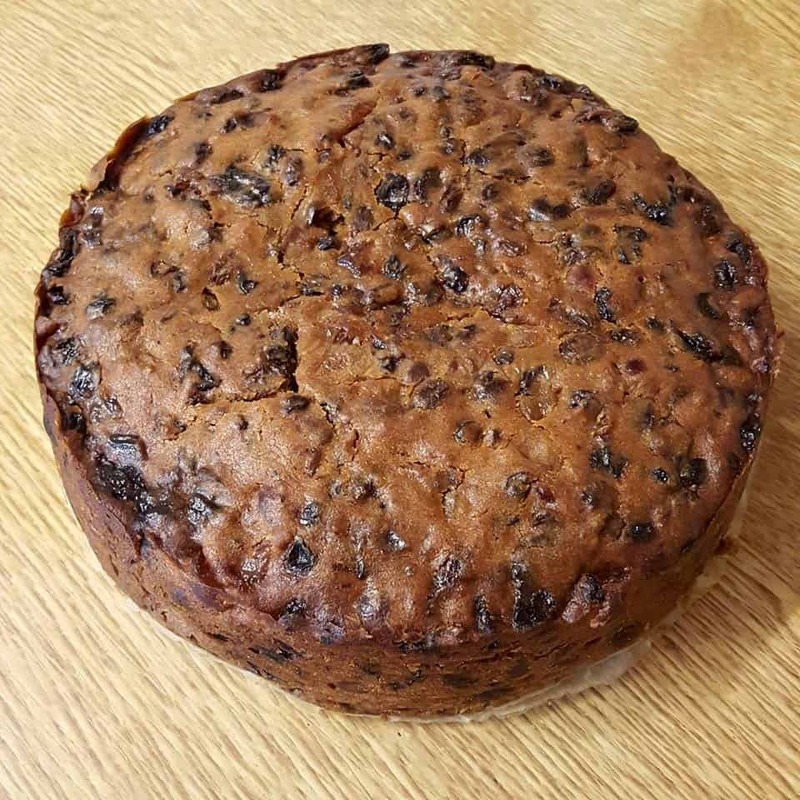 Let us know if you make Lise’s Mum’s Christmas cake! ← Introducing The Nutrition Detectives!